Drivers using the Severn Bridge, which spans the River Severn and River Wye between South Gloucestershire and Monmouthshire in South East Wales, have welcomed news that toll fees will be scrapped this year. Currently category one vehicles up to nine seats pay £5.60 to cross the bridge with category two vehicles up to 17 seats paying £11.20 and category three vehicles, over 18 seats, £16.70. "It looks like Santa, in the form of Welsh Secretary Alun Cairns, will be delivering an early Christmas present in south Wales this December by bringing forward the scrapping of the Severn toll. "Many would argue that this should have happened years ago, but it will be welcomed by all motorists who use the crossing daily which can add up to annual bill in excess of £1,000 for a car. Business drivers, holiday makers and commuters will have endured significant delays at the pay booths over the years. Perhaps now the Government may have an appetite to review other toll crossings where financially viable." Tolls are a form of tax which applies to users of the toll road or in this case the bridge. The fees allow new roads and structures to be built and maintained without raising taxes on the general public. There are 23 toll roads in the UK, 18 of which are river crossings. 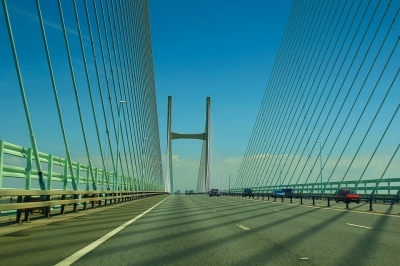 Click for a guide to UK toll roads and bridges.